The Land for Wildlife (LfW) program is a voluntary property registration scheme for landowners who wish to manage areas for biodiversity and wildlife habitat. Land for Wildlife encourages and assists landholders to include nature conservation along with other land management objectives. A “working towards” registration category is available to landholders who do not qualify for full registration at the first property visit. Advice will be given to the landholder to help them work towards full registration. 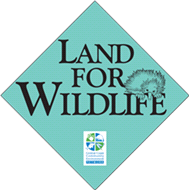 a Land for Wildlife sign in recognition of their commitment to wildlife conservation. ongoing support and advice through – workshops, field days, newsletters. To apply to become a registered property you will need to complete and Expression of Interest Form. For more information on Land for Wildlife please contact our Landcare Support Officer Alison Ratcliffe.